The exhibition (13 April – 2 September 2018) is produced in collaboration with La Monnaie de Paris museum, where it wil be on view during autumn 2018. 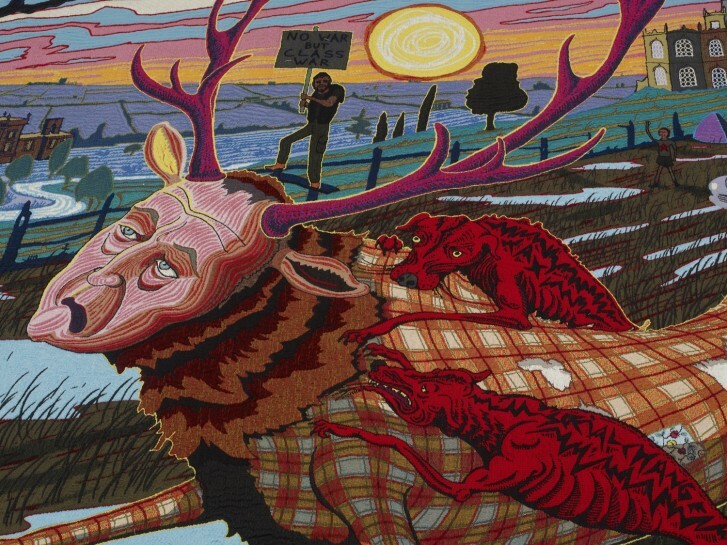 Grayson Perry is a great chronicler of contemporary life, drawing us in with wit, affecting sentiment and nostalgia as well as, at times, fear and anger. In his work, Perry tackles subjects that are universally human: identity, gender, social status, sexuality, religion. Autobiographical references – to the artist’s childhood, his family and his transvestite alter ego Claire – can be read in tandem with questions about décor and decorum, class and taste, and the status of the artist versus that of the artisan. Perry uses the seductive qualities of ceramics and other art forms to make stealthy comments about society, its pleasures as well as it injustices and flaws, and to explore a variety of historical and contemporary themes. He works with traditional media such as ceramics, cast iron, bronze, printmaking and tapestry, and is interested in how each historic category of object accrues intellectual and emotional baggage over time.